An exhaust gas temperature gauge is device that, as the name suggests, is used to gauge the temperature of an exhaust gas, typically, of an internal combustion engine. It provides an indication to the driver that the engine could be overheating and needs to be checked. An exhaust gas temperature gauge is also known as an EGT gauge or a pyrometer gauge. It comprises a thermocouple or a temperature sensing probe and is designed to detect high temperatures. The gases typically emitted from vehicles include nitrogen oxide, carbon monoxide and other particulate matter and pollutants such as sulphur dioxide and ammonia. An exhaust gas temperature gauge also provides an indication of the health of an engine. Increasing number of regulations with regard to emissions and environmental impact of vehicular emissions is expected to drive the growth for the exhaust gas temperature gauge market. The need to adhere to the Euro VI norms by 2017 is one such factor augmenting the growth of this market. The automotive aftermarket is another major driver for the exhaust gas temperature gauge market. Technological advancements in the automotive industry is another factor driving this market. 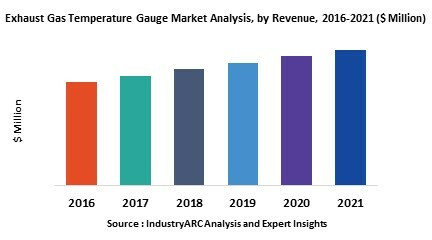 The North American and European exhaust gas temperature gauge markets are relatively saturated owing to the maturity and also the recent ongoing slump in the automotive industry in these regions. Asia Pacific has growing economies like India and China and hence will be associated with a healthy growth rate till the end of the forecast period considered in this report. Increasing levels of disposable income of the population in countries like India, China, Brazil is expected to drive the growth of the overall automotive industry. 14.10. Hella KGAA Hueck & Co.